UnigineEditor has context menus to facilitate various operations. In addition to commonly used operations, such as Create, Delete, Cut, Copy, Paste, Rename, Clear, Open, there are specific operations that depend on the window or parameter. Place as Node Reference Create a node reference by placing a selected *.node asset in the scene. 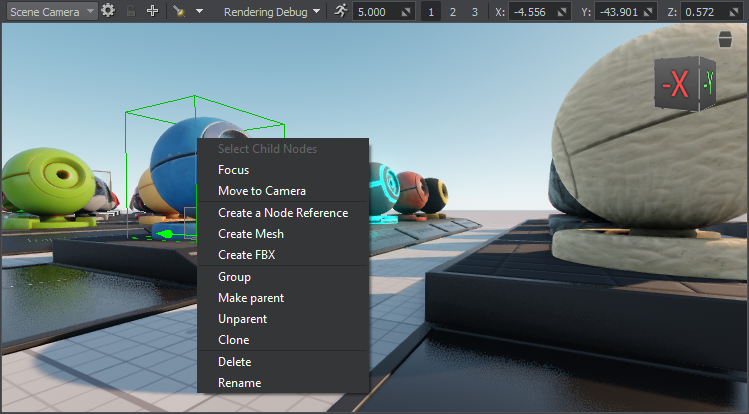 Place as Node Layer Create a node layer by placing a selected *.node asset in the scene. Place as Node Content Create a node by placing a selected *.node asset, which can be any node type or a hierarchy of nodes, in the scene. Inherit Create a child asset. Available for materials and properties. Reimport Reimport a previously imported file. Used to implement updates that have been performed in a source file after the import. Show in Explorer Show a selected file in Explorer. Show Runtime in Explorer Show the runtime file of a selected file in Explorer. 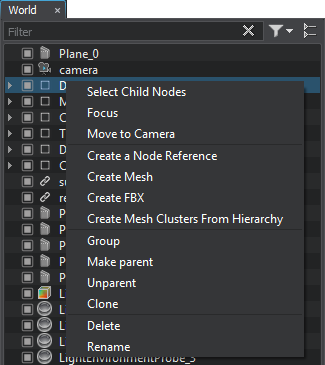 Select Child Nodes Select all child nodes of a node without selecting the parent node itself. Available for parent nodes. Focus Make the scene camera focus on the node. Move to Camera Move the selected node into the scene camera's focus. Create a Node Reference Create a node reference of a selected node and store it in the current folder of the Asset Browser. Create Mesh Create a mesh of a selected node and store it in the current folder of the Asset Browser. Create FBX Create an *.fbx file of a selected node and store it in the current folder of the Asset Browser. Create Mesh Clusters from Hierarchy Create a mesh cluster or clusters from a selected hierarchy. Group Create a dummy node and make selected nodes its child nodes. Make Parent Select a group of nodes and make a right-clicked node a parent of the group. Unparent Detach a node from its parent. A detached node is placed at the same level as the former parent. Clone Clone a selected node. Inherit Create a child asset. Show Asset Show an asset in the Asset Browser. 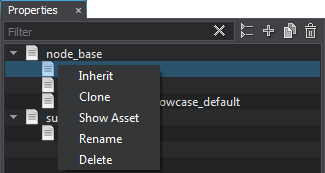 Delete Permanently delete an asset from the hierarchy and the asset folder. This action cannot be undone. The Viewport Window has two context menus depending on where you click: if you click a node, the context menu is the same as in the World Hierarchy window, clicking outside any node opens the Create menu. The Parameters Tab has several types of context menu depending on the parameter's type. Step up Add one (+1) to the current value. This operation can be also performed by scrolling, when the cursor is in the spinbox. Scrolling while holding the Ctrl key pressed adds 10 each step. Step down Subtract one (-1) from the current value. This operation can be also performed by scrolling, when the cursor is in the spinbox. Scrolling while holding the Ctrl key pressed subtracts 10 each step. Add — add an entered value to the current value. Subtract — substract an entered value from the current value. Multiply — multiply the current value by an entered value. Divide — divide the current value by an entered value. Current Value / Entered Value = Real Number. Real Number is transformed to Natural Number by cutting off any digits after the decimal point. Natural Number * Entered Value = Rounded Value. Copy Values Copy values of all parameters of a property. Paste Values Paste values to all destination parameters that have the same name and type as the parameters of the copied property. Move Up Move a property one line up in the list of properties. Move Down Move a property one line down in the list of properties. Reset Set all property values to default. Copy Parameters Copy parameters of selected surfaces. Paste Parameters Sequentially Paste parameters copied from source surfaces to destination surfaces in the order they appear in the hierarchy. Paste Parameters By Surface Names Paste copied parameters if their surface names are the same as destination surface names.